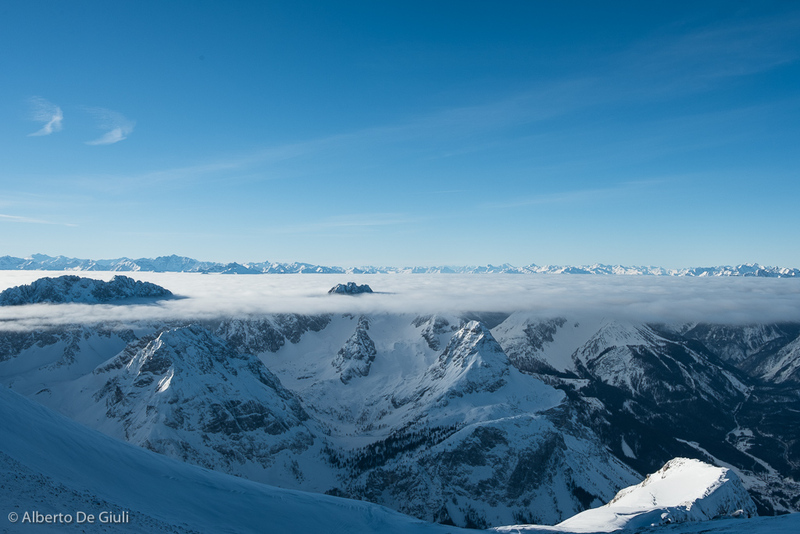 The Zugspitze with its 2962 meters is the tallest peak in Germany. 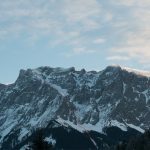 Located on the border between the Tyrol and Bavaria, it’s part of the Wetterstein mountain range. 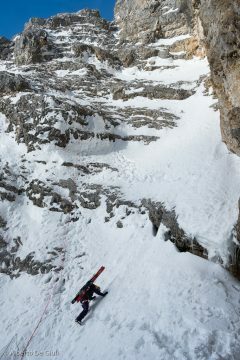 Its limestone reminds me a lot of the Dolomites. 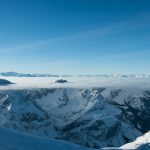 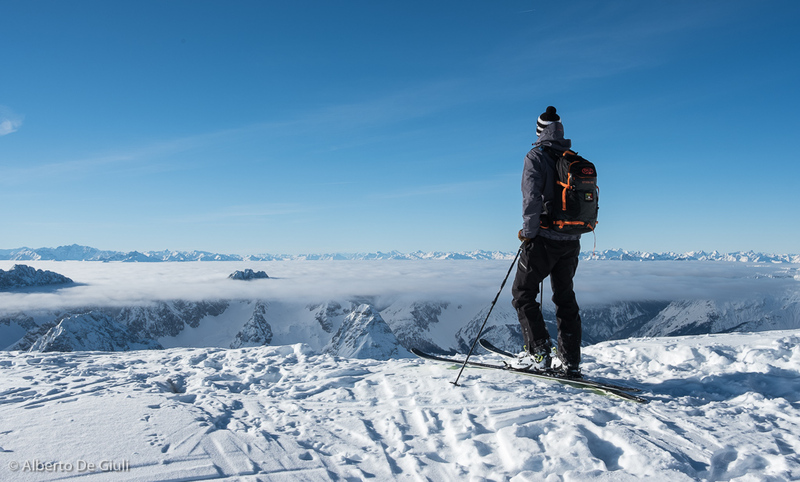 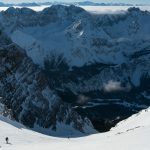 For steep ski enthusiasts, the Zugspitze features one of the most exciting steep ski descents in the Alps, the Neue Welt, which starts directly from the Schneefernerkopf (2874m), one of Zugspitze main summmits. 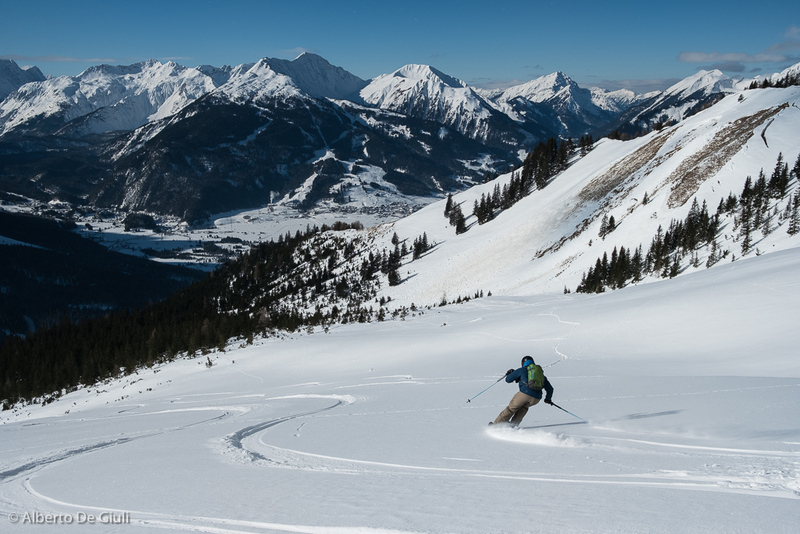 The Neue Welt goes along the south / southwest flank and all the way down to the Ehrwald, the beautiful village on the Austrian side of the mountain. 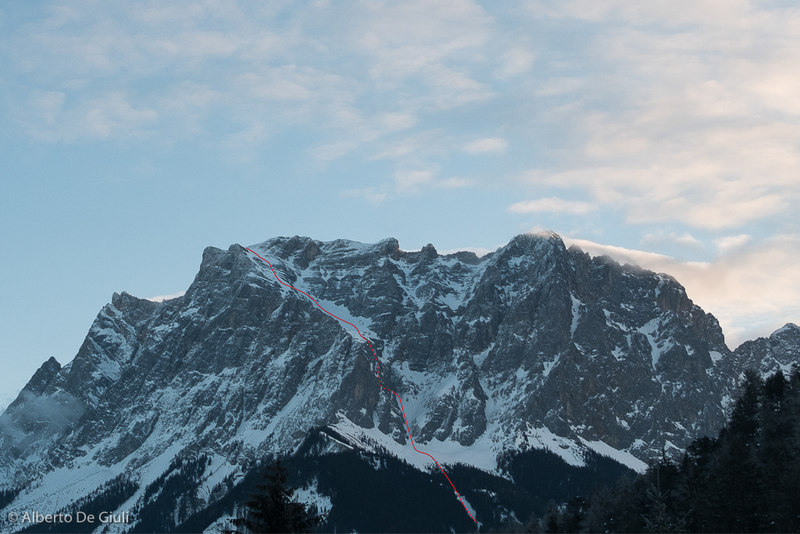 We’re talking of an almost 1900 mt descent, with a tiny effort of 150 meters climb with skins. 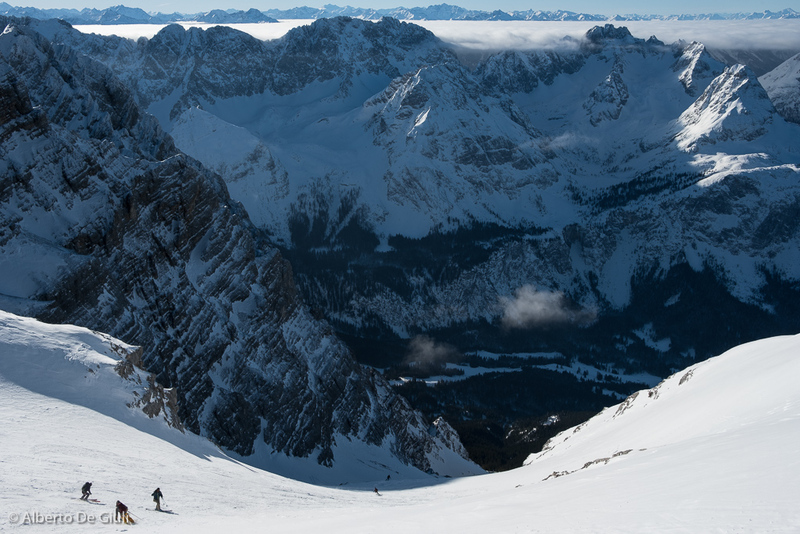 The first part of the descent faces East, it’s a beautiful open bowl all the way down to the first crux of the Neue Welt. 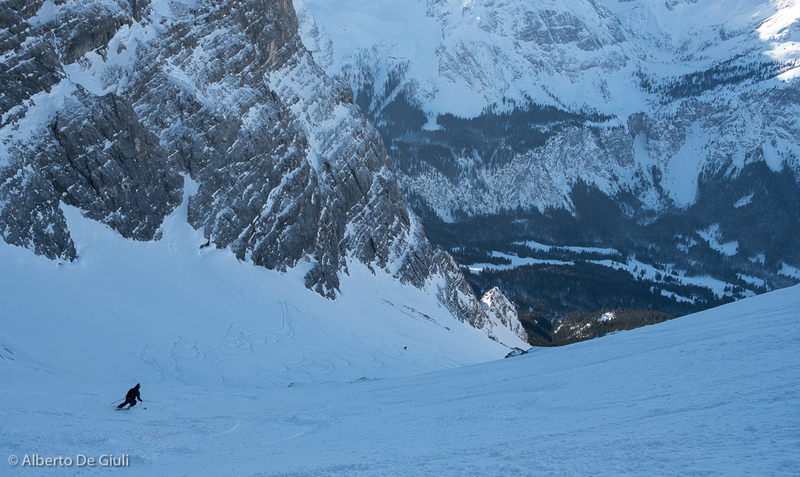 A narrow and short 40 degree chute brings you to the next open field facing West. 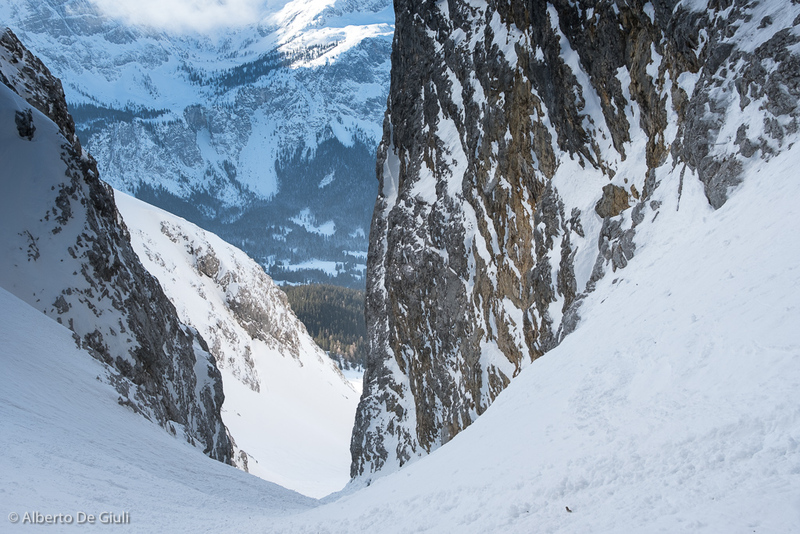 You need a stable snowpack on this part of the run, you likely won’t have any escape in case of an avalanche. 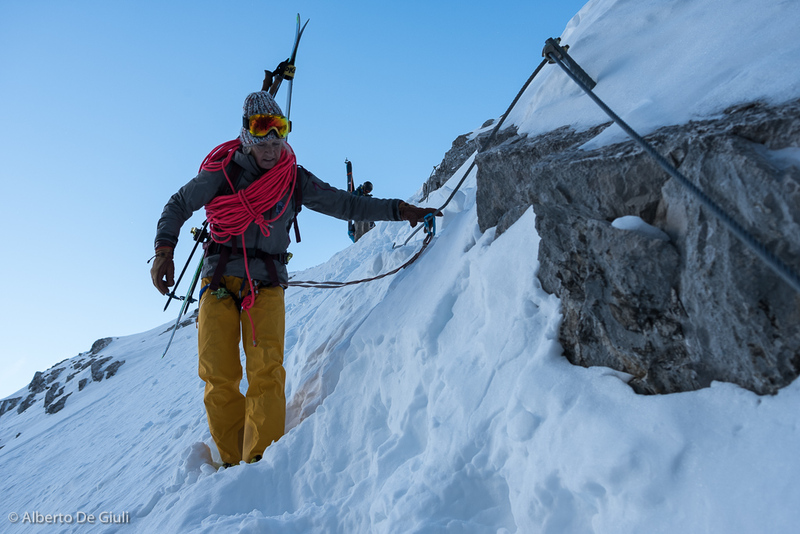 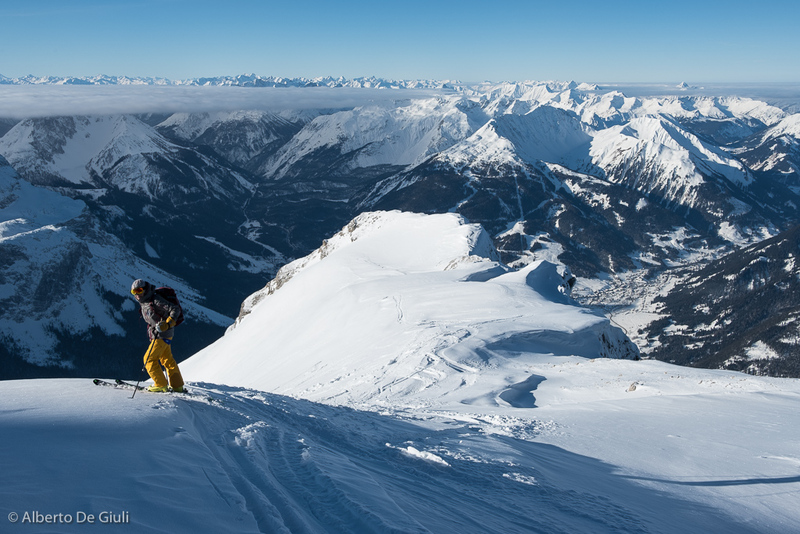 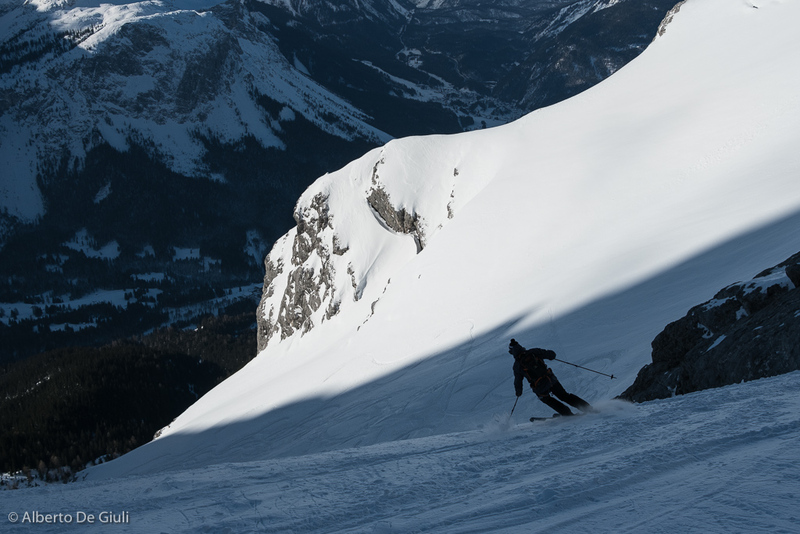 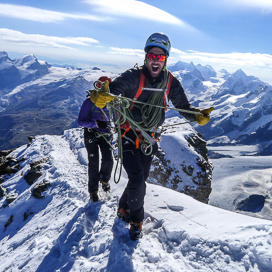 Once you get half way down the Neue Welt, you need to look for an exposed ledge skier’s left, equipped with a fixed wire, at the end of it you need to rappell for 50 meters in order to get to the top of the last steep and narrow couloir. 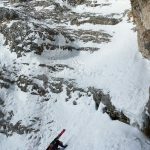 This is the second crux of the descent, the rappel is potentially exposed to some rock falls the steep couloir could be icy. 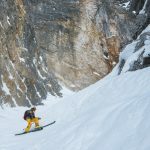 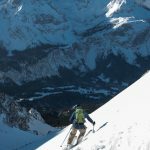 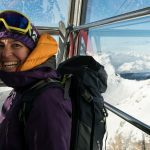 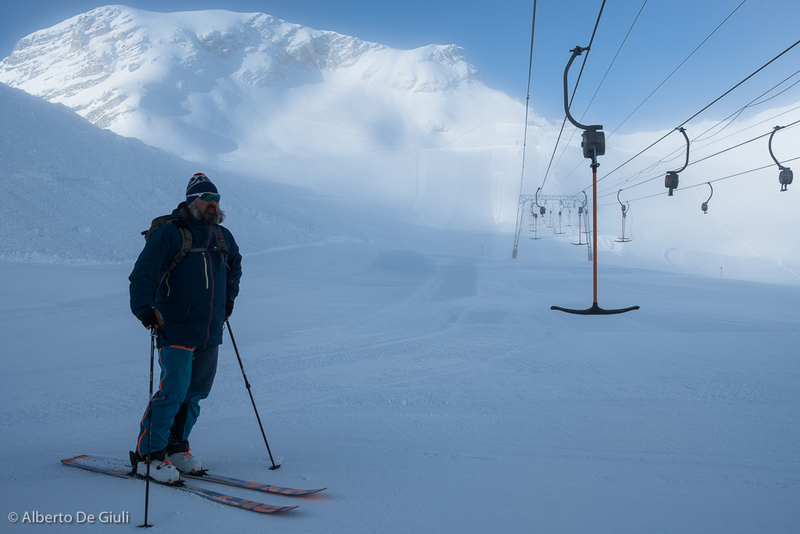 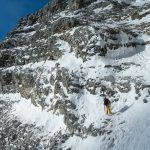 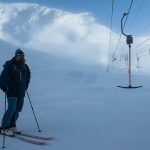 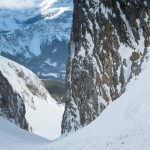 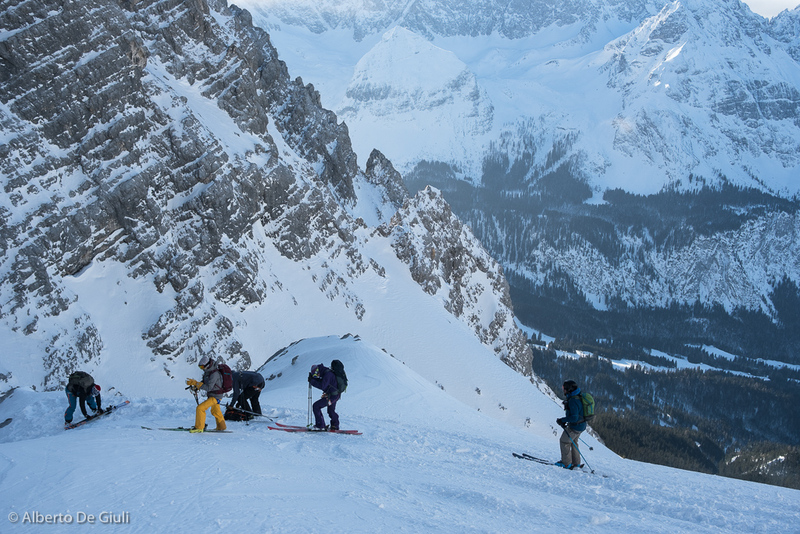 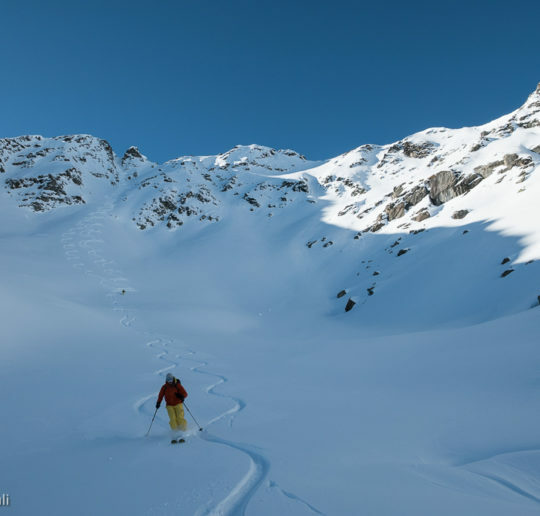 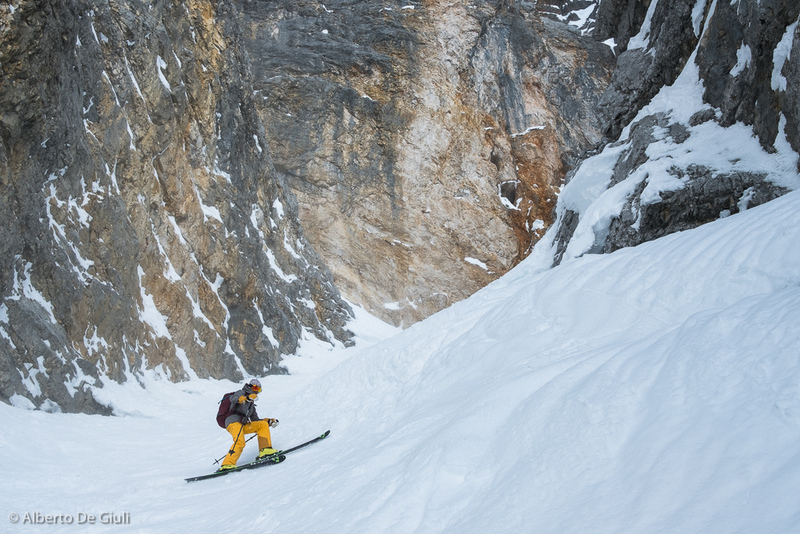 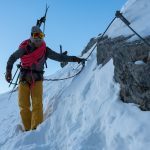 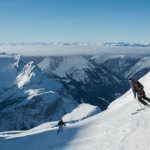 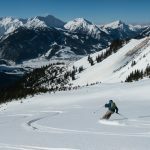 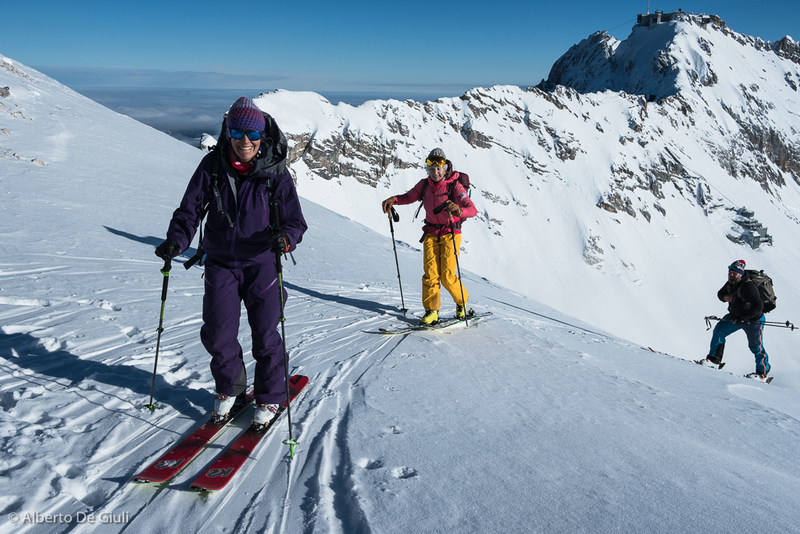 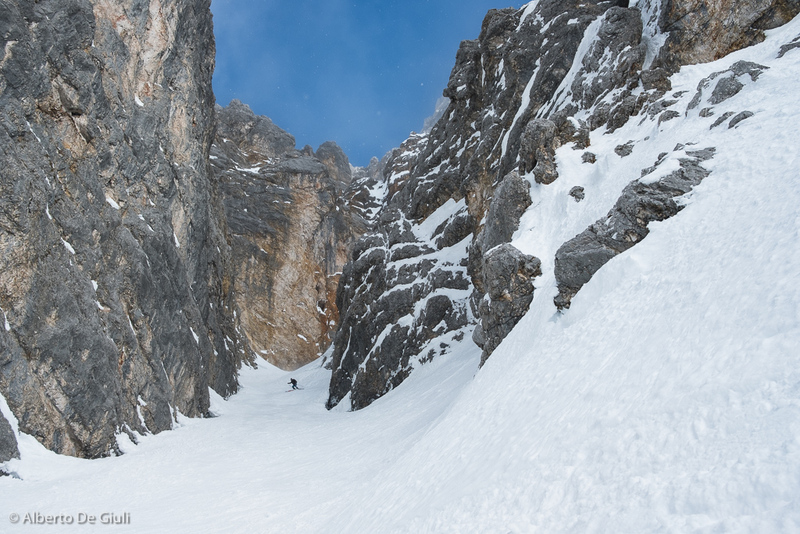 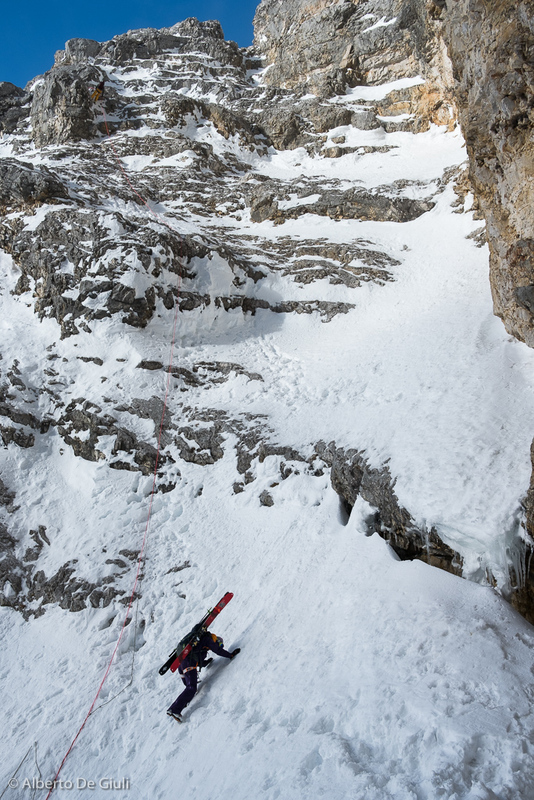 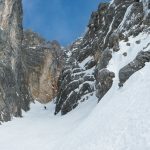 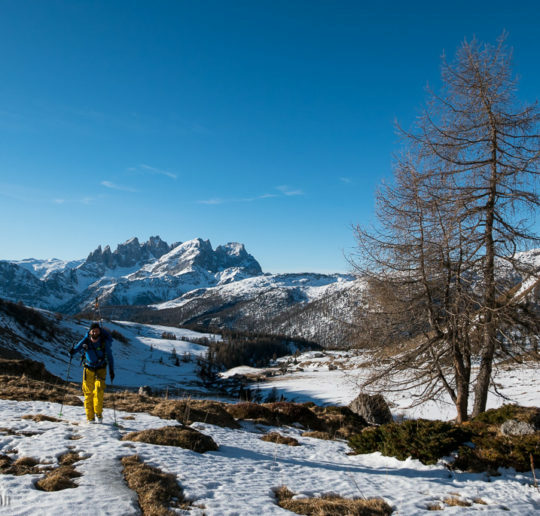 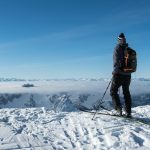 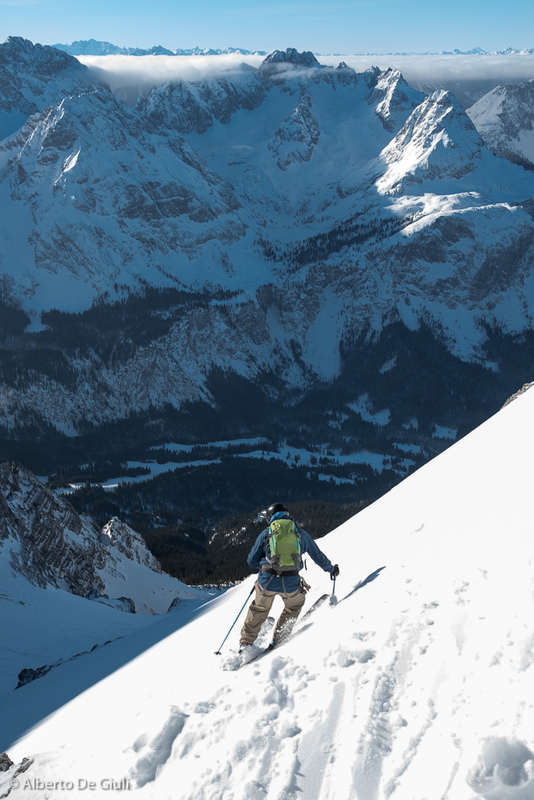 If you ski the Neue Welt on the spring time, you likely find the couloir pretty avalanched with hard blocks all around, so booting down skis in the backpack could be the only solution, until the slope widens up. 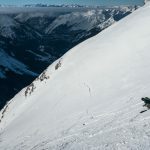 There’s a last narrow and steep spot before reaching the open and mellow field of the Holz Wies and the trees above the Ehrwalder Almbahn lifts, this last part might become annoying with crusty and heavy snow. 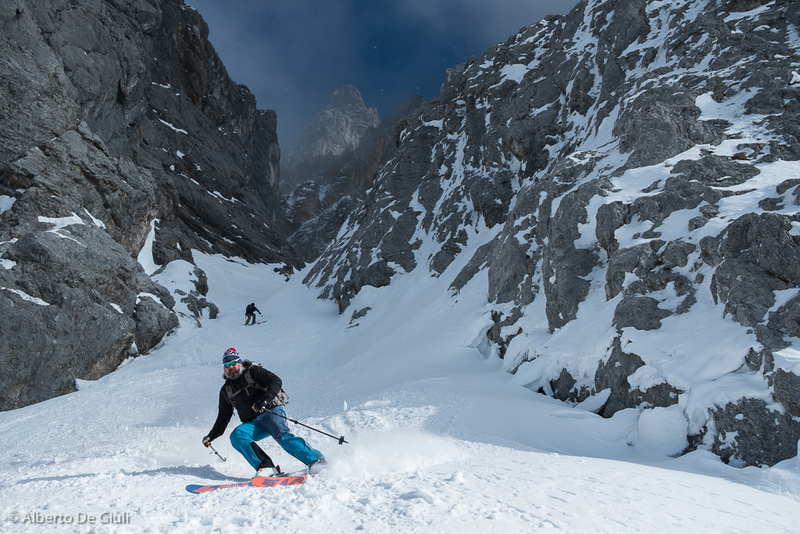 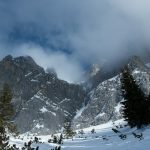 I had been dreaming about this descent of the Zugspitze for several years, and I thought the big snowfalls which hammered all the valleys in Austria for more than two weeks had finally brought good conditions for giving the Neue Welt a go. 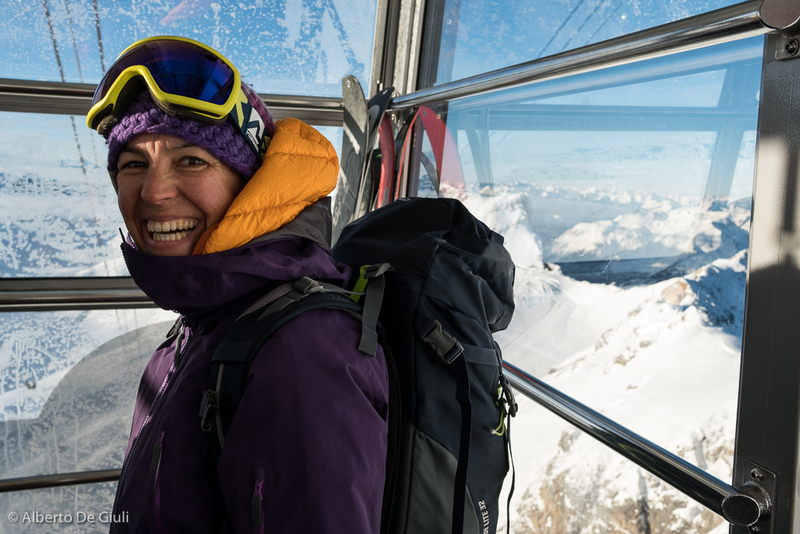 There’s not so much to do at home these days, so I didn’t miss the chance to go and meet some local friends and share this great adventure together. 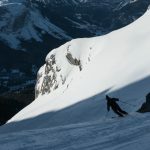 The snow was safe and well skiable, some sections were already slightly crusty but we had no problem at all. 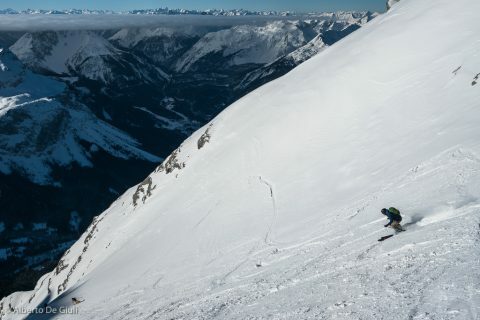 Two days before they got better snow down there, but in these descents I think the whole experience is much more important than the perfect snow. 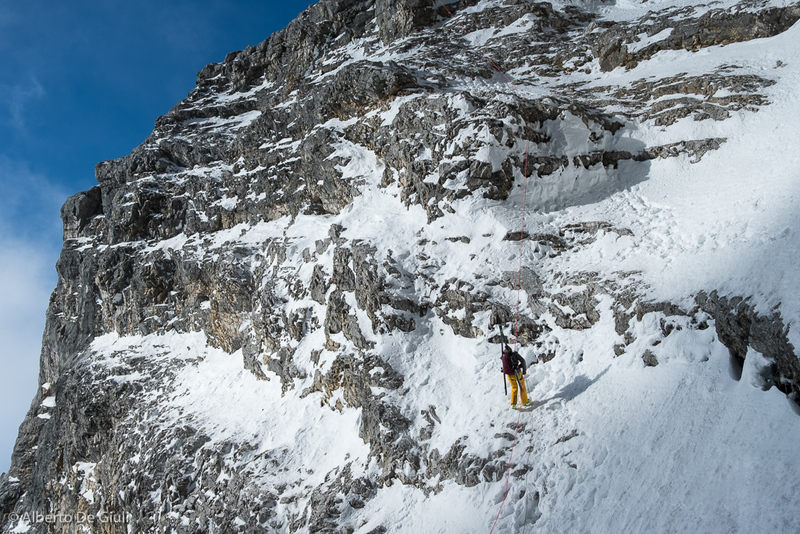 There were no other groups beside the six of us, we rappelled down very quickly and we were already back to the car at midday, thanks to the great cold snow down the last trees. 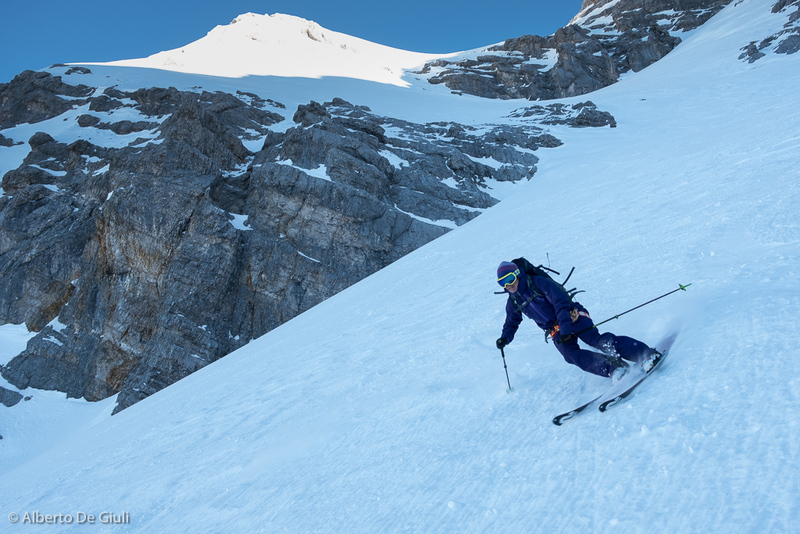 For me it was a great day of steep skiing, at the end of the day I spent way more time in the car than with my skis on, but it’s been a true adventure just as I expected. 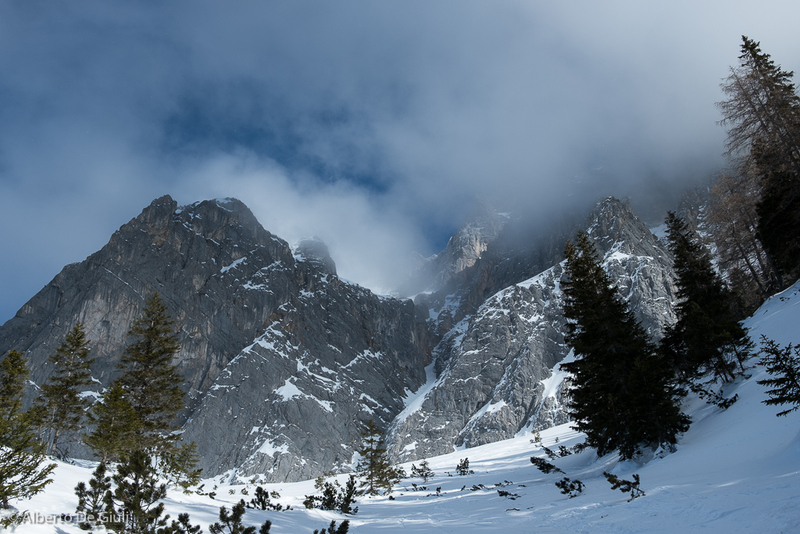 Perhaps less steep than I thought (I would say as steep as our Val Setus in the Sella group), but definitely on a big mountain that impressed me with its size and views. 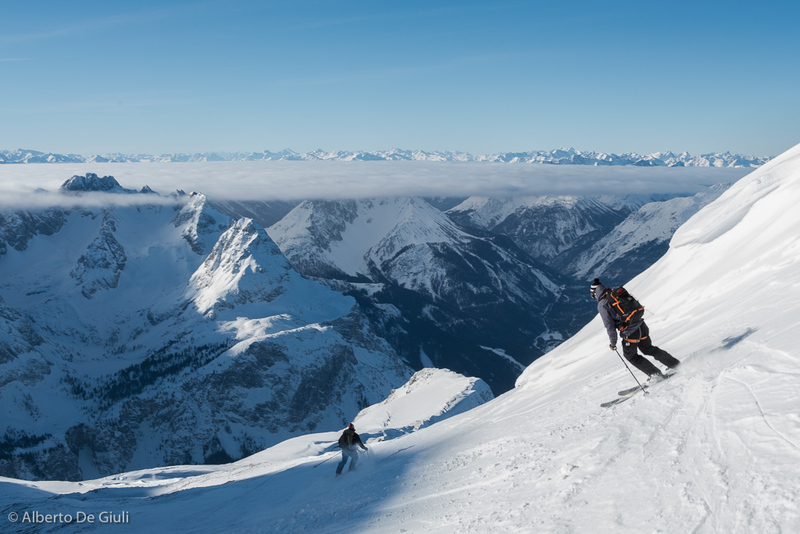 Skiing the Neue Welt on Zugspitze. 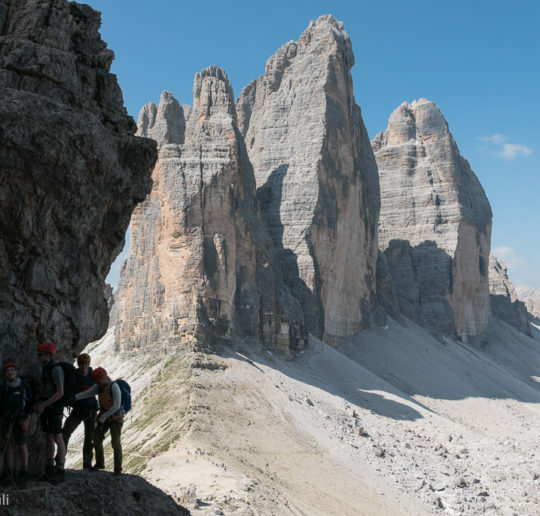 Hiking, via ferrata and rock climbing in the Dolomites in June. 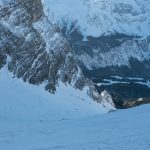 Paterno, Torre Toblin, Marmolada and Sella Towers.